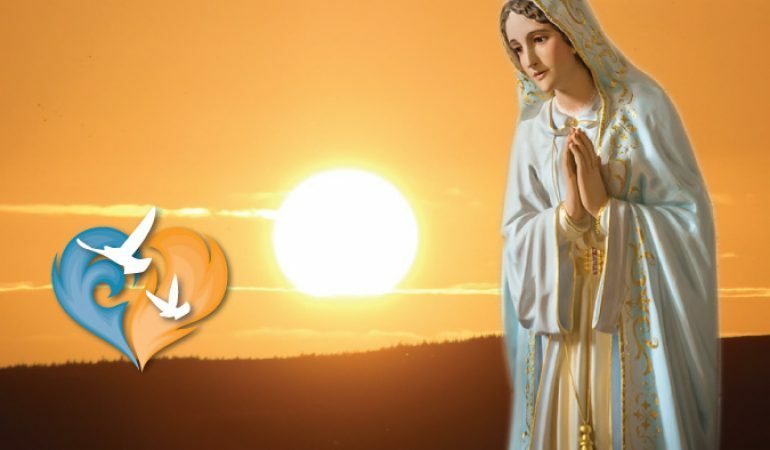 This month, we will commemorate the centennial anniversary of the final apparition of Our Lady at Fatima and the fantastic miracle of the sun which was witnessed there. October 13, 2017 will mark the day exactly one hundred years since the magnificent day on which Our Lady appeared to the three shepherd children and provided a miracle which was witnessed by approximately 70,000 people and as far as twenty-three miles away. As this date nears, rumors of new miracles or terrible world-ending events circulate by social media or word of mouth. And yet, I think the most important thing for believers to recall is not the events which took place a century ago, but rather the message which was given then. The description given by Lucia about her interaction with the Blessed Mother on this date is surprisingly short (read it here). Only a handful of dialogue is traded between Lucia and Mary. Compared with some of the earlier apparitions, this one may seem at first glance lacking in heavy substance. However, I am prone to believe that it is the simplicity and clarity of Mary’s words which underline the power of her message. 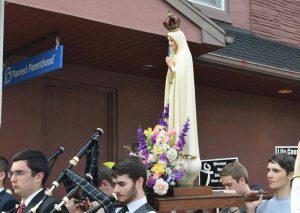 To begin with, Mary, to whom we have given the title of Our Lady of Fatima, introduces herself as Our Lady of the Rosary. She requests that a chapel be built on the site of the apparitions in her honor and that everyone continue to pray the rosary daily. Again, these requests are profound in their simplicity. The rosary is described as “the most beautiful and richest of all prayers to the Mediatrix of all grace” by Pope Saint Pius X. The Blessed Mother implores to Lucia that the people of God- including ourselves- utilize this powerful prayer! To me, it speaks volumes that at this moment when tens of thousands of people had gathered, the message is as simple as persevere in prayer. The second part of their interaction was Lucia’s presentation of certain requests and intentions which faithful had asked for her to bring to the Blessed Mother. Surely, as fame had spread of Lucia’s involvement in the apparitions, scores of people would have brought their intentions to her. Their intercessions would have been for cures, conversions, consolations, miracles, and any other need or want which the faithful had. The Blessed Mother responds that while some of these petitions would surely be granted, others would not. She explains simply and genuinely that these faithful need to seek amendment and forgiveness. In her final words to Lucia, Mary implores that people cease offending God, who is already so offended by sins. Taking a moment to dwell on these final words is important as they give meaning to the signs which follow. Mary underlines in her final exhortation how paramount it is for people to stop sinning against God. As Catholics, we recognize that man is the subject of a fallen human nature. Despite his best efforts, no man is able to control himself so perfectly that he never commits sin. Yet, in the Gospels, Jesus gives to His apostles the power to forgive sins. “Whatever you loose on earth shall be loosed in Heaven” (Matthew 18:18b). 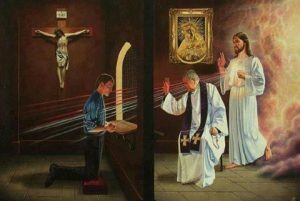 The power of the Sacrament of Penance is so powerful that it releases the sinner from his offense with Heaven. When Mary asks man to cease offending God, the first step is in seeking this Penance, which truly does reconcile the offense of a sinner with God. Of course, to highlight the power of the message Our Lady has given, a great miracle is worked in the sky. Roughly 70,000 witnesses in Portugal, some as far as twenty-three miles away from the site of Mary’s apparition, beheld the sun. The sun – blazing and yet not blinding – moved from its natural place in the sky. The onlookers saw the sun spin and spiral, seeming for a moment to rush towards the earth itself. In another moment, the sun was replaced and the people were left in awe and wonder. This miracle itself emphasizes the seriousness of the Blessed Mother’s message to Lucia. God, all-powerful, has control over even the sun in the sky. He can and does work wonders. Even in the moments when it seems as though doom is inevitable, God is in control and acts with mercy. Finally, the reactions of wonder and awe effected by this miracle hopefully caused a renewed faith in the witnesses. 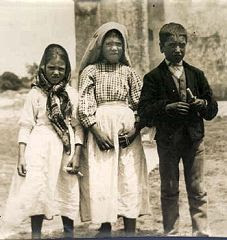 These emotions, gifts of God the Holy Spirit in fact, should inspire all people to pay heed to Our Lady of Fatima’s primary message: to persevere always in prayer. For myself personally, meditating on Our Lady’s apparitions at Fatima reminds me of Mary’s great love for us. Like a true mother, she comes to her children, offering instruction and direction. Through the humble and devoted mediation of shepherd children, Mary speaks to the whole world. Mary is entirely loving and wishes only what is good for us. Yet, she still has power and authority to provide miracles. She does not abandon her children. This gives me confidence in my vocation as a seminarian. I know that I have a Heavenly Mother who intercedes for me. By devotion to her, I am drawn closer to The Lord. After all, that is the true goal of any and every true devotion. Is that you Nikolai, carrying Our Lady’s pyre? This is a beautiful reflection on the Miracle of the Sun. Reminding us to reflect on the message Our Mother gave us on this occasion, not just to concentrate on the spectacular happening in the sky. As Our Lady of Medjugorje is begging us always to pray, pray, pray. And especially for our Shepherds. Amen. It is. 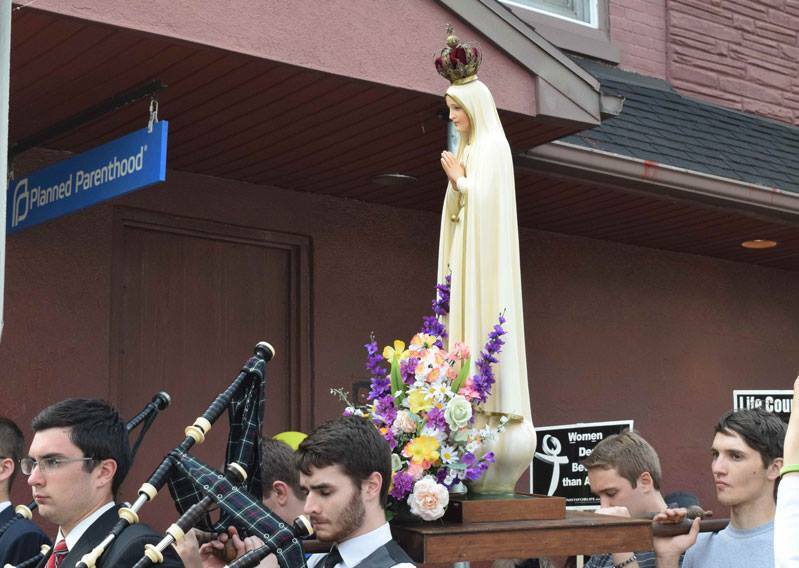 That was a Marian procession/Walk for Life I was able to help with in Reading, PA. Thank you for your thoughts, Kathleen; you are so right! Yes, that is Nikolai helping to carry Our Lady of Fatima in the procession. Nikolai, what an awesome writer, you are. This must be genetic from your Mom’s side of the family. Your article on Fatima is most informative and presents a challenge to all Catholics.